As I was looking through my collection of recipe photos for something to post this week, nothing really inspired me, and since I’m running a little late on the post anyway, I decided I’d just look for something cute from an outside source. I immediately thought of my husband’s birthday, which is next week! For those of you who are new and do not know, I have to always make a yellow cake with chocolate icing for his birthday. It’s his favorite. It’s what he likes. End of story! Don’t get me wrong! It’s actually one of my favorites too! But I just can’t blog about the same cake over and over! So for today’s post I thought it would be fun to share an alternative to the plain yellow cake with chocolate icing. I remember seeing this Sunflower Peep Cake along time ago on Taste of Home. I can’t believe I never shared it before because it is so cute! I don’t think I’ll be making one of these next week, as I’m certain that hubby’s birthday is a Peep-Free Zone, but it’s fun to think about just the same! Hope you enjoy! Prepare and bake cake according to package directions, using two greased and waxed paper-lined 9-in. round baking pans. Cool for 10 minutes before removing from pans to wire racks to cool completely; carefully remove waxed paper. Level tops of cakes. Spread frosting between layers and over the top and sides of cake. 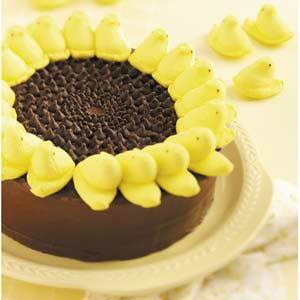 Without separating Peeps and curving slightly to fit, arrange chicks around edge of cake for sunflower petals. For sunflower seeds, arrange chocolate chips in center of cake. This post is sponsored by Petite Rouge. Are you looking for the perfect finishing touch? Petite Rouge has it. Simple, elegant blossoms to brighten up any outfit. Dainty enough for your smallest princess. Sophisticated enough for your growing girls. Clip on a headband or wear alone. If you’d like to sponsor some posts on Simply Sweet Home, please check out my PR page. Saw this on Tip Junkie and had to check it out — awesome! So cute! This is such a cute cake! I think that I am going to have to make this for my Grandmother as at the ripe ole age of 87, she still loves her Peeps! That definitely is a fun cake, we made it a couple of years ago. It's also pretty with white frosting and pink or blue peeps for a different flower. My daughter loves peeps and it's one her favorite cakes. haha peep-free zone! so cute! What an adorable lil cake! I just wanted to stop by and say hello and thanks so much for stopping by and visiting me! I'm a new follower as well – great blog! You can link up every WED.-SAT. Wasn't that amazing?!?! ?Well,this is my first time on your blog and your Sunflower peep cake absolutely bowled me over!That was cute! Haha… what a cute cake! Great idea. Can't wait to show this pic around. This is awesome! It's so dang cute! Well, you picked a good one to post! Sunflowers are my favorite:) What a CUTE cake! What a fun cake! I LOVE PEEPS!!!! I am so making this! Thank you for sharing this! oh my…this is adorable…love the idea! thanks for sharing. How cute! And tasty I bet. Cute! I'm featuring this at http://womenwhodoitall.blogspot.com. That is such a great idea! It's so cute, great job! I would love it if you would link it up to our What I Made Wednesday Linky Party! !